My name is Janus Bravour. I am thirty-two years old. I am going to die. The room in front of me is vast. 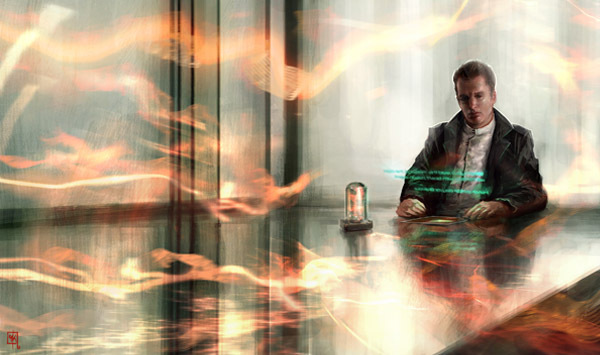 It belonged to a high-powered Caldari executive who, like most of his ilk, was on the wrong side of the revolution. I would have preferred a smaller room. A room this size means you can't see everything around you, can't contain all the events occurring within its space. This is important. When you're a member of the Caldari State leadership, you need to contain all events within its space, lest they spiral out of control. This room has spiraled out of control. We gutted some of the more indulgent architecture - my leader and State ruler Tibus Heth took entirely too much delight in tearing out the cages that had held the strippers and soldering them into a box that now serves as the executive's new office - but the basics, the less-noticed ephemera that were truly Caldari, we kept. There is a sand waterfall, and laser birds that light through the air, and quiet sigils, cast on the floor, that morph from one meaning to another. My name is Janus Bravour. I sit in a room with a waterfall running down one of its walls, the sand hissing as it trickles through the invisible gutters below. I approved of the reconstruction. I take life seriously, as I've had to in these serious times. There are indeed those among us who feel that life is but a joke. They disdain the work we've put into rebuilding this empire, gutting it and retaining only the purity of our State, and they would like to see life return to the ways of old. These are our enemies, and I take them very seriously. The birds flit through the air, oblivious. Their movements give me a little hope, deluded though it may be. I notice they always fly in pairs or groups. I had never seen this before. My name is Janus Bravour, and I am the Chief Operating Officer of an entire empire. I am second-in-command to the most famous person in the world, a citizen revolutionary named Tibus Heth. Under Heth's guidance we toppled the ruling body of our empire, we reclaimed the planet that was our birthright, and we went to war. Tibus Heth has many enemies. So, by extension, do I.
Heth is an impulsive man in person, governed by a roaring undercurrent of emotions. He is a brilliant military strategist, but his expertise is on the field, in the smoke and the carnage. The silent fighting that goes on in the everyday business of running an empire he leaves, truth be told, to me. I support Heth and what he has accomplished, and have laid down my life as a wager. But I am not an impulsive man, which is why I complement his ruling, and thus he and I will never see eye to eye. I serve the interests of the State, as does Heth, but I do not feel that I serve it alongside him. We are each pulling it in a particular direction, and it is by this pull, this constant motion that is nonetheless fixed in place, that the State is given the power to continue existing. If we were lovers, which we are not, we would be running our shared home right now, wondering whether a friendship and a shared set of ideals will carry us through the arguments in times ahead. I envy the birds their synchronized flight. If I were to try the same I would die in an instant. And yet I must remain in some kind of motion, no matter how still it might seem. Stagnation is death. The moment we stop moving, we stop being viable human beings and become mere animated husks, solemnly waiting to die. I see everything so clearly now. I expect it results from this personal revelation I've had of my mortality. I am going to die, and thus my mind is taking in every last detail it can before the final call. I am being entirely too clinical about this. Given the circumstances, mind, I think it's excusable. Aside from the birds, the sigil and the waterfall - all of which are intangibles of one sort or another, and don't really count towards the furniture in this room - there is nothing here but the closed door at the far end and the desk at which I sit. The window behind me casts a nice warm shadow on my workspace, and I know if I turned I would see the sun. I'm trying to resist the temptation. On this desk are three things. The first is a glass cylinder set on a small, black base. The cylinder is about the length and width of my palm. Inside it are interconnected spiraling tubes, like strands of DNA woven into a tapestry, and inside those tubes are two globules of a silvery liquid reminiscent of mercury. The two blobs constantly pass through the tubes, pouring through them in defiance of gravity and inertia. In their paths they revolve around each other like electrons around a nucleus, inextricably entwined but always at a distance. They never touch, neither each other nor the invisible core they encircle, and they never stop moving. It occurs to me that neither I nor Heth will ever truly be part of Caldari Prime. We encircle it, keeping its core contained. If we should fail, the core will not be compromised, but only so long as another one takes our place posthaste. I truly hope this will be the case. The second item on my desk is a picture, taken from space. The background is a rich maroon, halfway between blood and rust. In the foreground, if such a term even applies to a thing as monumental as this, is a white globe inlaid with golden lights and frozen masses of clouds. This is Caldari Prime, the core of my existence. The third item is a message, a greenish halo lit up in the air above my desk. I am sitting deathly still in my chair. Only my eyes have moved. Everything I've ever done has brought me to this point in time: Sitting here, in my office, unmoving, reading the news of my death. This message is from an unknown sender, and I have no doubt that if anyone looks for it later, they will find it has disappeared. It doesn't recriminate, nor does it chastise. It is brisk, clear and honest. It says that this room has been filled with a poisoning agent that was activated at the reception of the message and will respond to human motion. I am breathing it in right now, into and out of my lungs, as I have been ever since I sat down in this room. If I move, wave my hand or even cast a last glance at the sun shining behind me, the agent will coagulate into a material that will stop my heart. Somewhere in this building there will be a person - several persons, likely - who fell from their orbit of duty. I will move and I will die, and they will ensure the room is thoroughly ventilated before any investigation takes place. They will also guarantee the investigation finds I died of natural causes, and that I get a funeral befitting a Statesman. Honor will be upheld, I'm sure. And while all of this was completely unnecessary - the poisoning agent and the traitors and the whole setup will have taken lot of time and effort - it was meant not merely as an assassination but as an insult, one to put me in my place. I have entered a trap where nothing I do will help. I am powerless to interfere. If I act, if I do anything other than sit perfectly still in this little kingdom of stagnation, I will die in an instant. My name is Janus Bravour. All the roads are open to me, and all of them lead to my end.